Good and evil; there never is one without the other. First and foremost let me say I am a HUGE X-Wing fan. I play it regularly, and haven't had a bad time yet. And, there are no doubts that there are lots of similarities between X-Wing and Attack Wing (and Attack Wing gives Fantasy Flight Games full credit for using their flight path system). And, there is no doubt that the X-Wing ships look a lot better, and that their being to scale is a major plus (Attack Wing ships are unfortunately not to scale, and while some look good, others leave a lot to be desired). But, there are actually quite a few differences that make Attack Wing a solid game in and of itself (that is, in addition to using the tried and true stuff created by FFG). Here are a list of my top 10 favorite differences. 10. In Attack Wing you take Evasive Maneuvers (X-Wing's Evade) and Battle Stations (X-Wing's Focus) actions. There are also some new actions like Cloak (discussed below) and Scan (which reduces the number of defense dice rolled by your opponent by one). And, there are lots of other verbiage difference, too, like Axillary Power token (X-Wing's Stress) and Come About (X-Wing's K-Turn). So, they changed the names of the actions and added some new actions to give it more of a Star Trek feel, and I appreciate the effort. 9. In Attack Wing you can attack ships when your bases are touching, and you can attack ships while you are on an obstacle. Not better or worse than X-Wing, just different. 8. In Attack Wing there will be ships that can move SIX forward, or do soft FOUR turns (in X-Wing the max are five and three respectively). None of the wave 1 ships can do this, but I look forward to using these abilities in future waves (at least they included these templates in the starter set). And, more maneuvers means more choices and flexibility. 7. 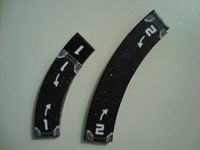 In Attack Wing there is a wider variety of firing arcs. Some ships have forward 90 and 180 degree forward arcs. If you count secondary weapons, ship abilities, and other upgrades, these increase to 270 or 360 degree firing arcs. Again, something worthwhile to think about when squad building and playing. 6. In Attack Wing you can disable shields. This is important since some special abilities require an active shield in order to use them. This way you can choose to take the damage to hull rather than shield to keep using a special ability. Shields can automatically activate before the next round (unless you want them to stay down). A nice thematic touch if you ask me, and a whole new layer of strategy. 5. In Attack Wing you can sometimes disable crew and upgrades when you use them (rather than discarding them). This means they can be used again. A great example are most Photon Torpedoes. You disable them when you use them, but then can use your action on a later turn to enable these cards so they can be used again. Definitely gives you some more options to think about (and it's nice not to pay a lot of points for upgrades that can only be used once). 4. In Attack Wing there are lots more Pilot, Secondary Weapon, Crew and other upgrade cards. And, when they release wave 2 there will be even more (and more ships total, too!). This adds another great dimension to the game, and adds significantly to its variety and replayability. 3. In Attack Wing you don't need multiples of many/any ships to play. The typical Attack Wing squad will have 2-4 ships in it (compared to 3-7 for X-Wing). You might want multiples of a few ships for the upgrade cards or certain types of squads. But, overall you'll need less ships total in your collection which helps the wallet in the long run. 2. In Attack Wing, some ships can cloak (2 Klingon and 2 Romulan ships so far). Lots of things are different when you are cloaked. You roll more defense dice, you do a barrel roll - called sensor echo in Attack Wing, you can't be target locked once you've been clocked for one full turn, and more. Being able to cloak definitely adds some great dimension/strategy to the game, and adds a lot to the Star Trek theme and feel. 1. In Attack Wing, some ships can move backwards (BACKWARDS, I say!). For Example, the Galaxy Class Enterprise can move backwards 1 or 2, and the Constitution Class Enterprise can move backwards 2. You can't do this in X-Wing (though they did just introduce a ship that can move zero). But, being able to move backwards is just AWESOME in so many ways! In sum, if like X-Wing and/or Star Trek, I think it is worth giving Attack Wing a try. There are lots of similarities, but there are also lots of differences that make Attack Wing a solid stand alone game in its own right. I have been keeping an eye on Attack Wing for a while because ...well...I am kind of a trek fan too. Even though it uses very similar mechanics there are enough difference to make it a distinct and still massively fun game to play. Thank you for enumerating them! Biggest difference: In Attack Wing there are more than 2 factions! The ability to swap different faction upgrades is also novel. (1) Star Trek lends itself to missions a little better (because of the scale and because you can do things like manipulate Crew upgrades--beam them to planets/stations--and the like). Also, each ship expansion comes with its own mission rules. (2) Star Trek is hyper-customizable and has no "player faction," per se. You can mix and match any ships you want with any upgrades you want (the only restriction being that it costs +1 Point to put an upgrade onto a ship of a non-matching faction). While this presents far more customizability options in ST:AW, it also makes min-maxing much more possible and dilutes some of the sense of sacrifice-versus-reward that comes with trying to build a squad in SW:X. If you want Vader's amazing pilot ability, part of the built-in cost and balance to that is that you have to bring along his TIE/Adv. You can't just pay 1 meaningless no-brainer point to slap him in the Millennium Falcon or Slave-1 or something. Some people like ST:AW's total freedom in customization, others (like me) prefer some adherence to faction flavor and the give-and-take decisions more inherent to SW:X list building. (3) Ship costing in ST:AW uses (at least to date) a very simple linear formula: (ATTACK+AGILITY+SHIELDS+HULL)x2 = Ship Cost. 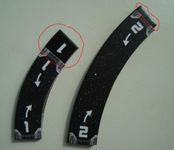 This overlooks the ship's maneuver wheel, any unique ability the ship has, its available upgrades, and the fact that some configurations are far better than others at the same cost (e.g. 6 ATTACK, 1 AGILITY, 3 SHIELDS, and 1 HULL (22 points) would be vastly superior to 2 ATTACK, 3 AGILITY, 0 SHIELDS, 6 HULL (22 points)). X-Wing's costing formula is far more nuanced and takes more subtleties into consideration. ST:AW has a very young tournament scene, but I suspect as the game ages and matures people will find ships that are overly efficient for their price and ships that are duds for their price (already, the Valdore seems like a good candidate for "overly efficient" while the D'Derix seems like a good candidate for "under-efficient"). Let me offer a different opinion. I believe this is one of Star Trek's most important differences and one that is undoubtedly for the better. In game where each unit has one attack, quantity has a decided advantage over quality. It's impossible to properly scale for any desired balance because if the point changes at all your scale will again be out of whack. Additionally in X-Wing action denial offers a double advantage for low initiative quick swarms. Attack Wing does not (yet) offer "quick kill" rules or upgrades, but goes a long way to nerfing swarms by eliminating the cheesy action denial tactic. Some people like ST:AW's total freedom in customization, others (like me) prefer some adherence to faction flavor and the give-and-take decisions more inherent to SW:X list building. Hyper customizability allows for "true" balance on the competitive scene. Without that it seems unlikely that factions can be truly balanced. I am personally convinced that the Empire is over powered in X-Wing (still love the game) and it bugs me. On the other hand in Attack Wing I also feel that right now the Feds are underpowered, but somehow I feel better playing faction only builds (both with my friends and in my local OP) knowing that I have an option. I like the fairly free crew-swapping since it is integral to the show. Consider the Defiant loading up Ometiklan and his platoon to go on a mission. Or Riker serving on a Klingon ship. Or Dukat's Bird of Prey & Sisko's Robinson. All sorts of real episodes are based on having a "foreigner" join the crew or take over a ship, so it really makes sense here. Consider the awful alternative (and what so many games have done): Different versions of each character just to allow you to squeeze them into different ships (or HQ worlds in the ST card game). Excellent review, Tony! I couldn't have said it better! I really like that there's a decided emphasis on Missions in the game, even while WizKids is encouraging a tournament scene. I think that's an area where Attack Wing leads X-Wing. And there's a deep well of material to draw from in Trek. Thank you Tony, Rouge Thirteen and others for a good review. It's nice to see true differences in the game style. Attack Wing also has a 6 straight, but not ship uses it yet. Voyager will have a 6 on the dial. When I posted this back in October it was true. Excelsior didn't come out until December.